The U.S. Navy announced today a ban on smoking aboard submarines while they are deployed below the surface after medical testing showed non-smokers suffered effects of second-hand smoke. It will take effect by Dec. 31, 2010. As with other branches of the military, smoking has long been a staple of Navy culture. For decades, cigarettes were even included in the emergency rations stored in lifeboats alongside food and water, ABC News says. "This policy was initiated for the health of the sailors who choose not to smoke," said Lt. Commander Mark Jones, spokesman for the Commander Naval Submarine Forces in Norfolk, Virginia. "It is unfair for them to be exposed to the unhealthy side effects of secondhand smoke." 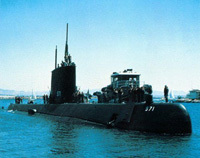 Jones said the submarine force conducted a study in 2009 on nine different submarines covering the four different classes of subs. In that testing, it found nonsmokers were being exposed to the effects of secondhand smoke. There are currently 57 submarines serving in the U.S. Navy, and about 13,000 sailors on submarine active duty, according to Jones. Of those sailors, recent polling indicates 35 to 40 percent are smokers, he said, CNN informs.